Contemporary fountains are built around a strict adherence to simple geometry. The elegant curves and ornate surfaces of Classical design give way to the rudimentary shapes that function as the building blocks of form. The most prevalent shapes are circles, rectangles, and their derivative elements, which in turn are customized to add drama, affect, and dimension through vertical impact. Circular and semicircular fountain designs are obviously gentler on the eyes and communicate an aura of self-containment that seems to center their surroundings. Sometimes a circular fountain can be used to center a special zone of interest, or even the entire yard in front of a home. Linear fountains typically stand out with what amounts to a sharp contrast of vertical impact rising up from a level surface of some sort. Both designs have their respective places in Houston landscaping design—particularly in modern and contemporary themes where the simplicity of minimalism is often combined with the more challenging elements of abstract aesthetic. 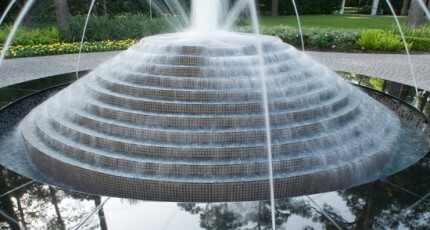 Contemporary fountains can be built from both standard and nonstandard materials. Some are built from various types of stone, such as precast limestone or a series of small boulders stack one on top of the other. Adding a stone fountain like this can be one way of grounding highly abstract themes in the natural world. Stone is a natural substance and readily appeals to the mind of the nature lover without overpowering the manmade aspects of modern landscaping. When costs are prohibitive of natural stone, however, decorative concrete can be rendered to appear as any type of rock. It can more easily be shaped into conglomerate geometric patterns that combine forms in visually challenging arrays. Even more challenging designs can also be created using plastic, glass, and steel, whose manmade origins contribute a distinctively mental appeal to the scene. Because they can tie Houston landscaping designs to both natural and manmade elements, contemporary fountains are some of the most popular additions to hardscape areas. A contemporary landscape design can easily consist of up to 80 percent hardscapes if you include gravel areas along with paved areas. In our city, hardscapes tend to lie very flat against the horizontal table of the land. 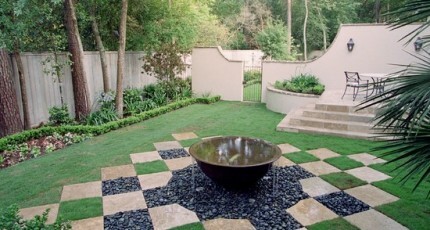 One of the ways we can add drama and interest to any such structure is to build a custom fountain into its surface. A fountain can be used as a central focal point in a hardscape, or it can be used as an offset center that points the eye toward an adjoining, related zone of interest. Contemporary fountains are also integrated into other elements of hardscapes, such as courtyard walls, contemporary swimming pools, or decorative walls that surround outdoor sculpture gardens. Softscapes are another element in contemporary Houston landscape designs that often require additional accent to stand out. Contemporary gardens typically feature low-level plants and a limited color spectrum that conveys the sense that life is fragile, limited in scope, and subject at all times to the pure mathematics of the surrounding physical universe. Even the sustainer of living things—water—is technically an inorganic substance that is somehow essential to their existence. The sheer irony of this fact can be beautifully expressed with a custom, contemporary fountain whose stark geometry pulls the entire garden design toward the mysterious, originating force of life itself.